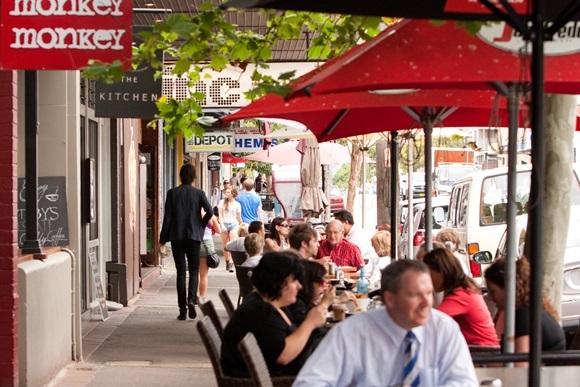 Newcastle’s original eat street – Darby Street – has long been a fan favourite with locals in the know, and with fresh entrants into this popular precinct, there’s never been a better time to revisit, or discover, the delights of dining, and dawdling, on Darby. With a rich food scene that’s quickly cementing the city’s reputation as one of Australia’s must-visit regional dining destinations, Newcastle’s gastro offering is split into sectors with delectable Darby Street in Cooks Hill renowned for its diversity, bohemian vibe and laidback style. The area is home to more than 25 cool cafes and award-winning restaurants offering fine cuisine at friendly prices at venues offering relaxed al fresco dining, unique décor and cosy indoor retreats that invite you to spend an afternoon, or more. And while it’s acclaimed as Newcastle’s original eat street, Darby Street has increasingly become famed for its eclectic mix of fashion, alternative music, homewares, second hand book shops and jewellery boutiques, with plenty of one-off finds. In fact, Darby Street is a haunt for up-and-coming designers of stylish urban wear for the young – and the young at heart. Pop into indie darling Honey Bee for fantastic fashion or lose yourself at Abicus, home to hard-to-find treasures from raw gear to retro vinyl discs and tapes. Beyond fashion, Darby Street precinct is also home to Newcastle Art Gallery, featuring national and international exhibitions year-round, and several private art galleries where local artists in residence are often available for a chat, while photographic studios and quirky gift stores mean it’s easy to while away the day checking out the original works and innovative ideas of some of Newcastle, and the region’s, most talented creative professionals. At the corner of Darby and Queen streets, the Hit the Bricks festival has turned otherwise empty walls into an open air art gallery, thanks to the creative flair of street artists from Newcastle and beyond in a clear visual sign of the city’s vibrant artistic scene. Another fab find is community-owned Darby Lane, the laneway between iconic coffee institution Goldberg’s and the edgy and urban Depot on Darby which, as an initiative of The Darby Street Traders and Newcastle NOW in partnership with the Office of Student Architects, has been transformed into a vibrant and appealing space for locals and visitors who are loving the newly lit pathway, seating areas and creative wall art which inspire people to meet friends, pause and enjoy the ambience. A serious challenger for the title of the country’s coffee capital, Newcastle boasts plenty of options for cravers of caffeine – and a number of them call Darby Street home. From colourful conversation, all-day breakfast, Campos coffee and perfect people watching at Frankie’s Place to high tea, sweet treats and fresh smoothies at Coco Monde Chocolateria or bold-flavoured, roast coffee in kitsch surrounds at Glee Coffee Roasters – there’s no excuse not to find the perfect grind.